So, I ran across a post on the superiority of chemical dyes over natural dyes that stated the lower classes didn't even have access to colors before chemical dyes. ...... The individual honestly believes that everyone who wasn't rich or upper middle class only wore white, brown, and black before the 19th C. Now, I put that up in the "we didn't have color before the 1930s. Haven't you seen the old films?!?" category. I just found it rather strange that anyone would actually believe that old joke. To help put an end to the idea that peasant=boring, drab colors, I figured I'd put a new compilation together regarding colors in the middle ages and Renaissance. 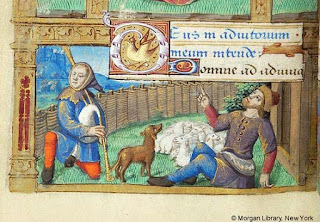 Here's the first post to the series I did last time on fabric types and colors available in the middle ages and Renaissance. In that, I went over what was available to show that, for the SCA, there really isn't such a thing as "that color didn't exist yet!!!!". If you can document it, you can wear it. I documented everything from hot pink to lime green and eye blinding yellow. The difference this time around is that I'll explore a specific class in the medieval society to see what they were wearing. Yes, the poor wouldn't have been wearing the expensive dyes but they weren't wearing monochrome either. 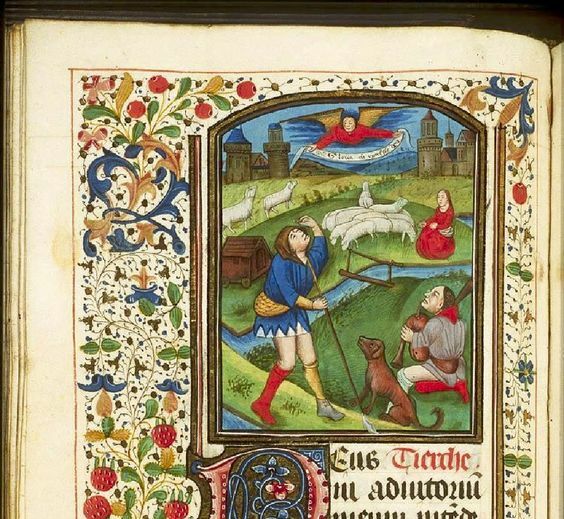 I'm looking at paintings, written evidence, and archeology to show what colors were possible. Now, I know a few people will say "paintings?! But those were highly stylized and meant to be pretty for the people viewing them, not true representations of life!" However, I call bupkis on that idea. 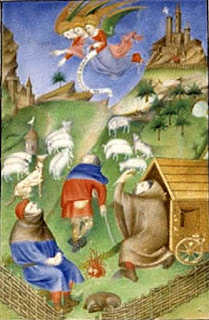 First, there are just too many different illuminations and paintings that show colorful garments for the beggars and peasants that it just doesn't hold water. Second, as I will show with the archaeological and written evidence, the poor were wearing colorful garments. 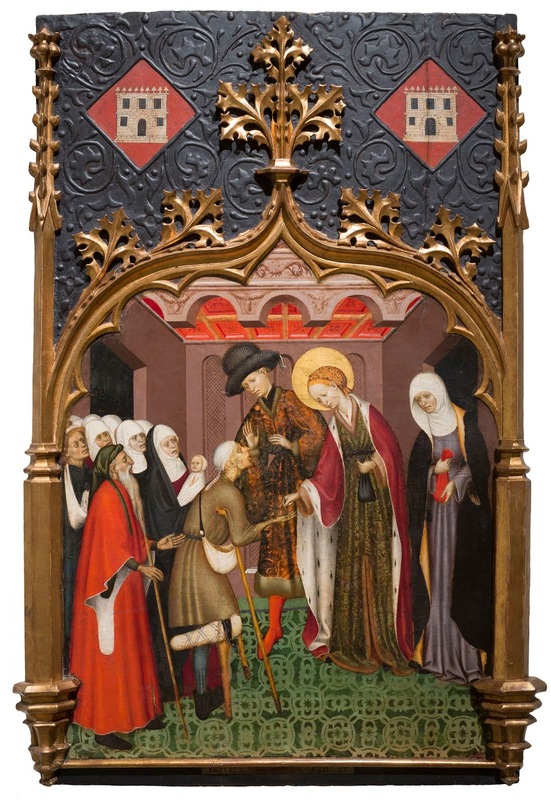 Above is a popular motif in the middle ages and Renaissance - a saint distributing alms. Any time a saint's life is shown, this is likely to show up at some point. 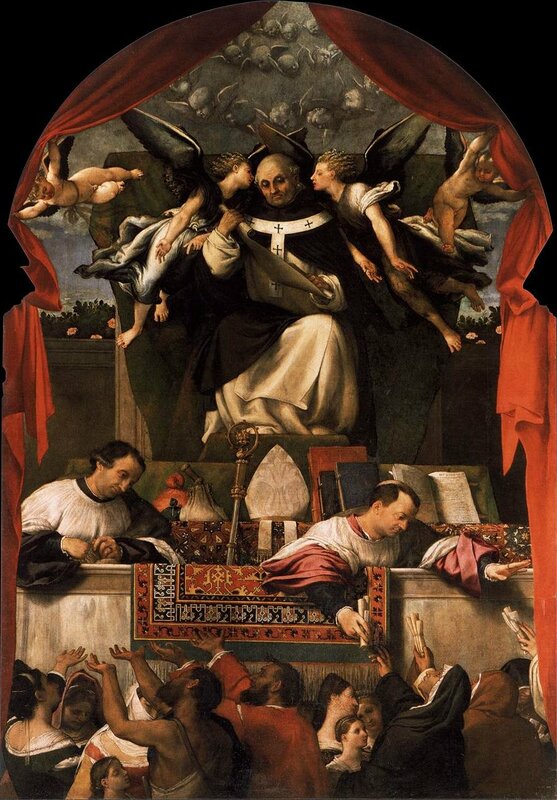 There are manuscripts, paintings, and drawings showing various saints handing out alms. Since the alms are always being handed out to the poorest of the poor, it gives us a chance to look at their clothing. 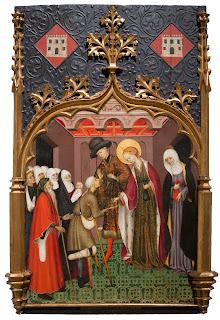 In the background, we can see the donor who commissioned the painting in a lovely green, with his hands in prayer. However, in front of him are some examples of the poor in the mid 15th century. The lady is wearing a peachy pink dress with a light blue scarf around her waist and arm. The child in front of her is wearing a dusty mauve tunic. Behind the lady is a poor man wearing a nice blue shade. They may not be the brightest colors but they aren't monochrome either. 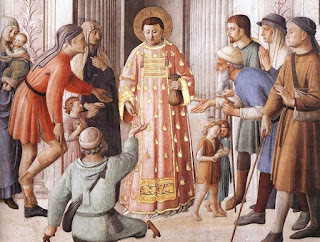 Just a few years later, the same artist depicted a different saint, Saint Lawrence, giving alms. Here, one of the beggars wears a rather rich red. 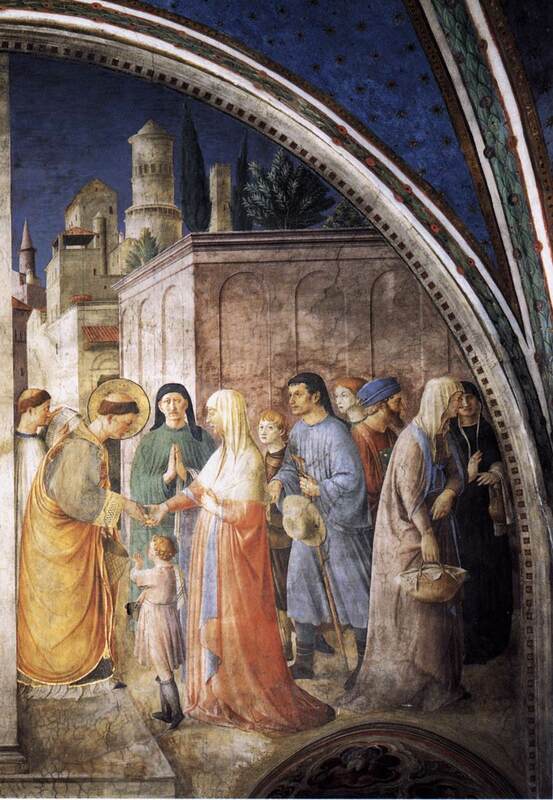 The little girl with the little boy to the right of the saint is wearing an old green dress. The baby in his/her mother's arms on the left is also wearing green. Although there are beggars wearing gray, black, and brown, there are also blues, greens, and reds. 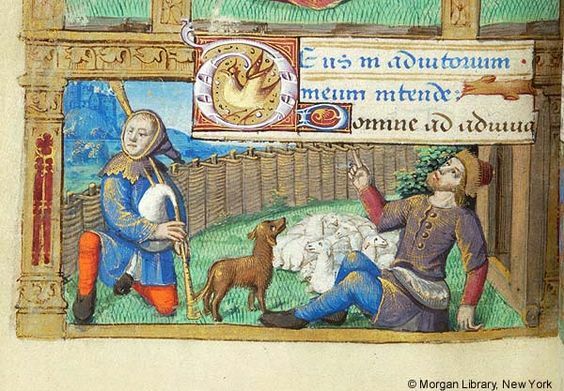 Check out the guy wearing blue on the right's burgundy hosen. Again, it might not be the best of colors but they aren't colorless either. Although the two paintings by Fra Angelico might have been considered a bit low key on the color, this one is anything but! This illumination shows a lady wearing a worn green cloak, a rather nice rose pink hood, and a mauve dress. 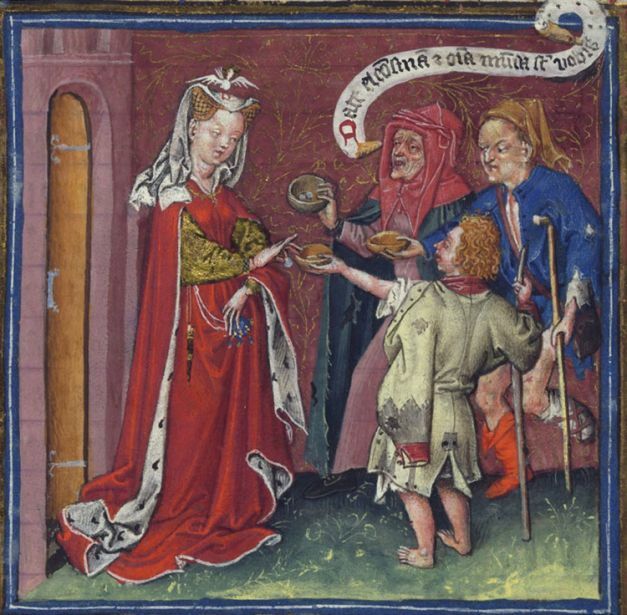 The man begging besides her has on a very bright blue doublet and an orange boot. In front of him is a guy with an older styled, patched up doublet in a light green with rose pink collar and cuffs. These are nice, BRIGHT colors but given the holes and patches, they are all clearly beggars. The gentleman at the front of the beggars may be wearing gray but check out the lady behind him! She is wearing a rather nice wine purple with her black veil. And the gentleman next to her? A good orange outfit with a green cap. Even the beggar wearing gray as blue hosen on. These aren't boring colors. They are very much dyed garments. This one is pretty much 100 years later than the others but, again, we see green on the bottom left and yellow, orange, and red. Although there are some blacks and browns, the over all colors are pretty much like what, really, you'd see today on the street. It's a good mixture. Now, the giving of alms isn't the only time we see the poor depicted in medieval and Renaissance artwork. 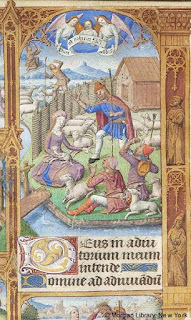 Another common theme is one of my favorites for other reasons: shepherds. Anyone who knows me, knows about my love for Shepherd's huts. Shepherds were not rich by any means; they were the working poor. Often, they are shown in rags; but, mostly, they are shown in common, peasantry outfits. I love these guys. Mister mis-matched hosen and his ruined hemmed shirt. Look at what the shepherds are wearing. Yeah, the one guy on the right is wearing gray...but with lots of red. Mister mis-matched hosen has yellow, red, and blue. He's wearing primary colors! The lady in the back who has her shepherds purse with her is wearing a lovely shade of red as well. Theses are not boring colors at all! 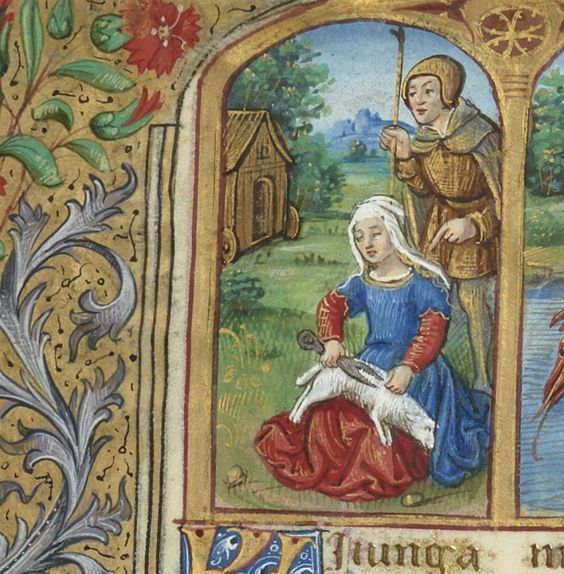 In this, yes, the guy in the back is wearing boring brown and gray but the lady sheering the sheep certainly isn't. She's wearing a lovely deep red and a blue overdress. Again, some brown but lots of blues and reds. This is pretty common through everything I've found - lots of blue and lots of red. Other colors are less frequent. There is a good reason for this and I'll show later in the writings and archeology of the period. There is no question these guys are poor. Look at the tatters the shepherd's clothing is in. However, they have fabulous colors! Pink, blue, yellow, and an orangy red as well as brown. Another example of not boring colors. Tell me that isn't lavender purple the lady is wearing. Again, blues, reds, and now lavender purple. 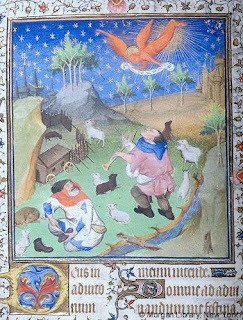 The shepherds are pretty colorful. I had to include these guys too because more lavender purple but also that fabulous "dear me!" orange on the guy to the left. Despite the amount of evidence here that poor did not mean boring colors in the least bit, I know there will still be people who will claim "but these are paintings! They are meant to be pretty! It's not what was really worn!" 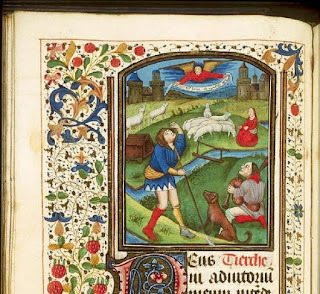 So, in the next post, I'll show some of the written evidence and the archaeological evidence of the poor wearing colorful garments in the middle ages and renaissance.